It is rather a rule that in the manufacturing of earthenware, the special and correct mixure of the clay is needed.That is the plasticity of the clay to be mixed must be counted. 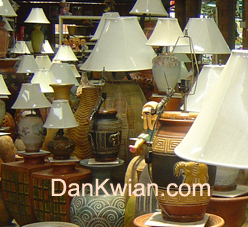 Here in Dan Kwian, two type of clay are used the very plastic clay and the mild plastic clay.The ratio of 2:1 is applied. In the mixing, dirts and other crude substances must be removed. The clay then needs watering to keep it wet at the moderate ondition then must be kept in apond-size 1x1 metres wide and 20 centimetres deep for at least 24 hours. Before the forming process, the clay body must be treated i.e wedging stage. Normally through the wetting process, and machine work.The machine will help wedge the clay and make it like tube-like shape, to be ready for the forming process . In the old days, the mixing of clay, the craftsmen will cover the clay with buffalo skin or pieces of wood, then keep steping on the clay ultil the clay is mixed. After that the clay will be bornd (either by auger machine or by hands) in the size of 25 - 30 centimetres long and 8 centimetres wide. 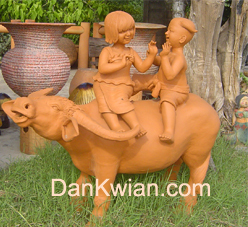 At this stage, the clay is called 'Loh' (the parameter used to mark the size of product to be made). The 'Loh' must be kept wet either wrapped by plastic sheets or in the old days by banana leaves and kept in the big jars for the 2 days. The throwing method is applied in the forming process.The tool know as 'Pamoon' (Potter's Wheel) is needed at this satge. Craftsman and this helper must work simultaneously.The craftsman will use the 'Loh' to produce the shape of the product as wanted (the coil method) while his helper kicks the wheel accordingly. Wet clothes are used to help keep the 'Loh' wet. 3.3 the relief design - using slip as attaching material and the combing method is applied. After the forming, the shaping and the decorating process, the products are moved for drying practically in grass huts that the roof are designed and built where the end parts are down to the ground in order to help protect the products from direct wind and the sun and of course from the rian.The floor of each hut is normally paved with sand. The drying period is depended upon the season then. In the summer, the drying may take 15 - 20 days. In the rainy season, the drying may take 30 days. In the old days, craftsmen, normally prepared the kiln (tunnel kiln) for the firing process, the ants' domes was favourable ones where the summits of the domes were used as chimneys, and the inside of the domes were used as firing chambers. The kilns in the old days were called "Tao Tu Reang" Today, kilns are made from raw bricks and the floors are at the same levels as the grounds. Other firing chanber parts are still the same. The firing process can be devided into 3 steps according to the temperature used. - Low temperature or "Lum", a name given by craftsmen, the temperature used is about 0 - 300 degree celcius. At least 3 big logs are used for burning right infront of the door of the kiln for 12 hours. - Moderate temperature or "Ud". the temperature used is about 300 - 900 degree celcius. Smaller logs are used burning at the door of the kiln for 6 hours. - Hight temperature or "Long Fai". The temperature is about 900 - 1,300 degree celcius.Wood and logs are burned inside the kiln. After all the logs are burned out, the door of the kiln must be covered or closed and kept for 48 hours before all the products are taken out.